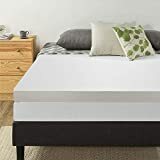 Memory foam mattress toppers are placed on top of the existing mattress for giving it a new look. It molds to the shape of the body so there are no pressure points which can cause soreness and discomfort. These mattress toppers provide additional comfort and are very light. It has excellent airflow and is as there is minimal heat retention, which makes you feel well rested in the morning. 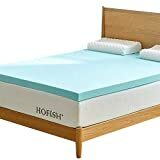 The market is flooded with different varieties of mattress toppers, some of which are priced very low. These low-cost toppers are packed with fillers which neither last very long nor do they provide any comfort. A topper with a high-density foam is ideal and offers excellent support and is durable. The higher the density means the better the quality of the mattresses. Though a 3 inch is ideal for average sized people, but 4-5 inches will provide you with additional support and comfort. 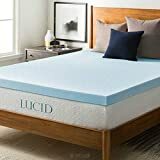 Lucid Queen-sized topper measures 60″ x 80″. The 3-inch ventilated gel memory provides pressure relieving comfort and additional softness. The unique memory foam formula improves airflow due to its ventilated design. 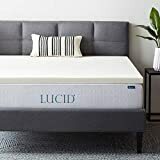 The plush gel material which is infused into the memory foam captures body heat providing you with a comfortable sleep climate. It contours your body allowing you to sink deeper into the mattress. The gel foam aligns your spine, so you wake up without a backache. This product is made in the US and ships internationally, is made without ozone depleters and has been regulated by the Consumer Product Safety Commission. The 2-inch think memory foam topper has a swirl design, though the design pattern might vary. Soft viscose-elastic memory foam adds comfort to your existing mattress and improves the quality of your sleep. The topper is certified by CertiPUR-US and meets the highest standards. It has a 3-year warranty and can be rolled and compressed into a 12″ x 12″ x 18″ box, ensuring easy shipping and storage. Helps you unwind and relax after a hard day at work. This product is highly rated and a favorite product with customers. The 2-inch gel foam relieves pressure points by evenly distributing the body weight. 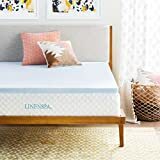 Full-sized Linenspa, 2 Inch Gel, Infused Memory Foam Mattress Topper measures 52.5 inches by 74 inches. It is CertiPUR-US certified and meets the highest standards. As it is infused with a gel, it regulates temperature and prevents overheating. This topper is an ideal way to revitalize your existing mattress. It comes with a 3-year warranty. 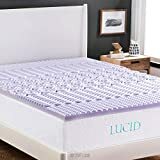 This lavender infused mattress provides specialized comfort to 5-zones and reduces pressure. The slight mix of woody and floral scent in the topper acts as a natural therapy for relaxation. 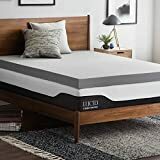 The queen size topper measures 79″ x 59.” Due to the ability of the topper to distribute weight evenly, it eliminates pressure points at ankles, knees, hips, shoulders, and head. Improves breathability due to its textured design and lavender perfume, acts as natural therapy while sleeping. The mattress is CertiPUR-US certified. Has a warranty of 3 years. 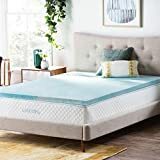 The cooling gel which is infused into this mattress captures and distributes the heat evenly ensuring a more comfortable sleeping environment. The mattress topper measures 37.5 inches by 79 inches with a 3-year warranty. Due to its 4-inch thickness, it gives you an added depth and comfort. 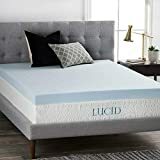 As it is infused with a gel material it captures and distributes heat evenly giving you a more refreshing memory foam experience. It contours the body evenly and alleviates pressure points. The ventilated design of the topper improves airflow and breathability. Compared with other memory foams, this topper ventilated for superior airflow. Thickness of the topper provides additional comfort. This memory foam is created by burning a bamboo plant in high temperatures and ground into a fine powder. It regulates temperature, moisture, and odor and gives you a cleaner environment. It measures 59 inches by 79 inches. The plush and therapeutic topper helps eliminate pressure joint pain. This topper is naturally hypoallergenic and resists bacterial growth, thus giving you a cleaner environment to sleep. It supports the lower back and spine. Bamboo charcoal infusion into the foam regulates, temperature, moisture, and odor. Bamboo Charcoal regulates temperature, moisture, and odor. This topper is an ideal solution to give a new life to your existing mattress and are cost-effective. These mattresses are kept an inch shorter on all sides, so the sheet fits neatly over the topper. It supports your neck, back, and shoulders, and thus relieves pain. It cradles the body perfectly and aligns the spine and improves posture. Measures 76x 80 for a king size mattress. CertiPUR-US Certified for performance and safety and prevents lasting body impressions. Its ventilated for airflow and provides a soothing temperature. Comes with a 3-year warranty. As it comes from the manufacturer directly, it comes at the best price. It compresses and can be boxed for easy storage and shipping. It disperses your weight evenly and gives you comfort and support throughout the night. It is manufactured without harmful chemicals and gives you a comfortable environment to sleep. Measures 75 x 79 inches with 3-year warranty. Infused gel into the topper ensures the optimum sleeping experience. Topper ensures optimum sleeping experience. This is a highly popular and highly rated topper with 30% lesser returns when compared with similar products. The body-conforming foam provides incredible comfort. It has a polyester mesh zippered cover. The gel infused technology gives a cooling effect, but an added sheet will be more comfortable for sleepers with high body heat. Measures 75 x 54 x 3 inches and It can be easily compressed for storage and boxing. Ventilated design for comfortable sleep. Special memory foam formula keeps the topper soft and airy. No added chemicals, which makes it environment-friendly. Molds perfectly to the body.